Like a lot of software and apps we use nowadays, Facebook is free. But these apps, and Facebook is the one that's focused on in this video, are free for a very good (and subliminal) reason. As Adam Conover explains in his latest episode of Adam Ruins Everything for truTV, we pay for it with our identity. What he means by that is, Facebook gives away the software for nothing but then by using it Facebook is able to log and record everything we do on their site, from pages we like to our interactions, the words we type. From that they can then build a profile of you, what your interests are, what you like reading, your likes and dislikes, your sexual orientation. They then sell all this information to advertisers so they can then target individuals with the precise goods and products they know they like. It's pretty creepy stuff and made even more creepy because Facebook colludes with the advertisers to monitor your behavior away from the site, and if you're a person who's more susceptible to advertisers, they show you more. Conover calls it "One of the most invasive advertising systems ever devised. "—the thing is, your whole online life is targeted in a similar way by Google and Apple and all the technology you use. 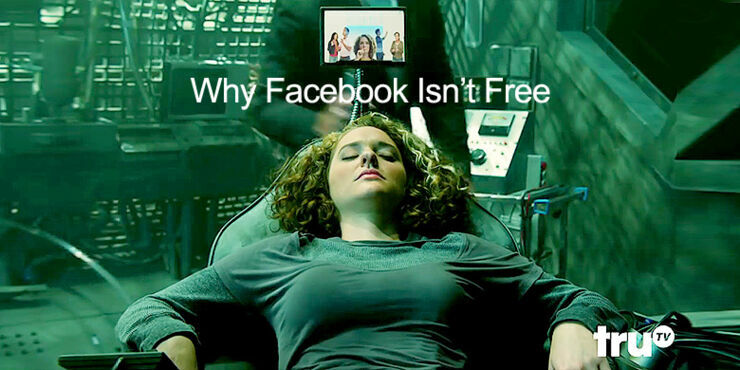 One day it won't just be software that's given away for free, Facebook will probably give you a free phone. To them it's not as valuable as the information they can get from tracking your virtual movements which can then be sold on for vast sums to advertisers. And it doesn't end there, with the Internet of Things this takes the tracking of our lives offline and into our homes. Imagine how augmented reality will impact when the virtual and real are intertwined, our entire lives will be tracked by corporations, governments, shady government agencies. At which point it will be time to go get your tinfoil hat on and head to that cabin in the woods. #Faceboogeddon—Did Hackers Take Down Facebook And Instagram Last Night?